About the BCS Machine Company, Inc.
BCS Machine Company, Inc. was established in 1996 and provides high quality tooling, machining, and manufacturing services to the orthopedic medical device community. BCS is a precision machining center with a solid reputation for exacting quality and a proven track record for the timely delivery of state-of-the-art instruments and precision machined implant devices to orthopedic medical companies. BCS' exclusive focus is for the manufacturing of Class I and Class II medical devices. BCS possesses a comprehensive understanding of the quality, engineering, production and delivery requirements that surround your product. Mission Statement – The BCS Machine Company, Inc. mission is to provide the highest quality advanced medical machining services available. With over 25 years experience with manufacturing advanced medical and precision components for the medical community, BCS provides unparalleled excellence in advanced medical manufacturing and design consultation services. Quality Policy – The BCS Machine Company, Inc. mission is to provide the highest quality advanced medical machining services available. With over 25 years experience with manufacturing advanced medical and precision components for the medical community, BCS provides unparalleled excellence in advanced medical manufacturing and design consultation services. BCS is committed to comply with the requirements and to maintain the effectiveness of its quality management system, to maintain ISO 13485 certification, and FDA registration. The Quality Management System at BCS Machine is certified to the ISO 13485:2016 standard by United Registrar of Systems (URS). In addition, as an FDA registered facility, BCS follows the requirements set forth by the FDA's Quality System Regulation CFR 820 Title 21. BCS believes that any effective quality program must be completely incorporated into the business program; they are not mutually exclusive. This philosophy ensures quality involvement in all areas and disciplines from contract review through final shipment. Establishing our Quality Management System for ISO and FDA compliance requires that BCS' quality management aspects be controlled and documented in all areas including process and quality planning, materials acquisition and control, special process requirements such as plating, first article acceptance and production/assembly operations, and through to final acceptance and shipping. Evidence of this can be found at all stages. Download the BCS Machine Company, Inc. ISO 13485:2016 Certificate of Registration. In-depth product design consultation skills provide value-added services by offering continuous design review and consultation throughout the instrument/device development lifecycle; thereby increasing customer and instrument/device value through cost effective, quality-based efficient manufacturing processes. In support of these services, BCS maintains an advanced information technology environment, including a state-of-the-art virtualized server infrastructure supporting a multi-user CAD/CAM programming environment that is capable of 2 and 3D contouring, 3D surfacing, and solid modeling techniques. BCS supports an open, standardized approach to interfacing with customer designs using software methods that support IGES, DXF, and PDES/STEP standards for MasterCAM, Solid Works, Pro-E, and Siemens PLM Software NX (formerly Unigraphics NX). Prototypes and production processes using state-of-the-art high-speed CNC horizontal and vertical machining centers, EDM Wire, CNC turning are supported by secondary in-house operations such as laser engraving, TIG welding, hand finishing and passivation. A rapidly growing success with multi-component, micro instrument, and implant assemblies is closely linked to rapid developmental processing ability with alpha, clinical, or pilot stage programs to produce economical advantages through iterative improvements and adjustments. On the shop floor, skilled machinist consistently hold tolerances to .0001” on a wide range of medical grade materials including: aluminum, cobalt chrome, stainless steel, titanium, and plastics. Total team commitment and unyielding manufacturing processes eliminate valuable time loss, equating to rapid customer response. With over a century of combined experience within the medical OEMs, contract medical manufacturing and aerospace arenas, the BCS team understands the demands and dynamics that can be associated with tight tolerance prototypes and production programs for the processing of hip, knee, shoulder, and spine systems. 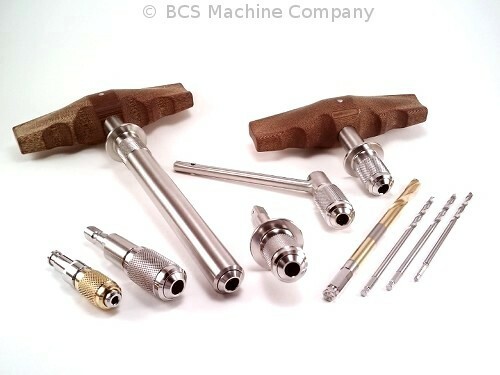 Product Line The BCS engineering staff have designed and developed the Quick Connect System Assorted Quick Connect System (QCS) Components (QCS) consisting of chucks, handles, cannulated and non-cannulated drills, taps, drill guide tubes, punches and Trocar/Bayonet point pins. This widely popular system is currently in use throughout the world and offers the surgeon and OR team critical time savings and ease of operation. The QCS system is an implementation of the recently awarded US Patent #7942253 co-developed by a BCS Machine Company principal. Location - Conveniently located within the Baltimore/Washington corridor of suburban Maryland; BCS Machine Company is an operations partner for your confidential manufacturing requirements. BCS maintains a FDA registered manufacturing facility that includes: a modern CNC infrastructure, an ISO 13485 registered Quality Management System, proactive engineering support services, and an advanced virtualized computer aided design and manufacturing system. BCS has several decades of experience in manufacturing and design consultation with Class I and Class II devices for medical device OEMs and Hospital research and development organizations. BCS provides a comprehensive package of manufacturing services for the medical community with primary focus on orthopedic devices. Our direct manufacturing, machining and assembly of orthopedic implants and instrumentation for total reconstructive systems are only a portion of what is provided. Additionally, many value-added customer support services are provided throughout the product development life-cycle, including: machining, prototyping, and design consultation. BCS MACHINE COMPANY, INC. © 1999-2019 All Rights Reserved.